Prior to coming to Samford, Carol Koch served as the Director of Hearing and Speech at Children’s Mercy Hospital in Kansas City, MO. Prior to that appointment, she was an associate professor for the Department of Communication Sciences and Disorders at Rockhurst University for nine years. 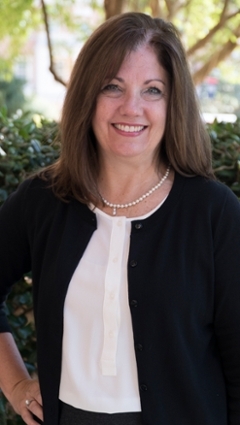 Her clinical, teaching, and research interests include: pediatric speech sound acquisition and speech sound disorders, assessment and intervention for children diagnosed with autism spectrum disorder, family and sibling experiences with a child who has special needs, early intervention, trauma-informed care, and clinical education/supervision. She has recently published a textbook on assessment and intervention for pediatric speech sound disorders. Koch enjoys traveling, photography, reading, and scuba diving. She is also an active member of her faith community. Koch, C. (2019). Clinical Management of Speech Sound Disorders: Case-based Approach. Jones & Bartlett Learning, Burlington, MA. Koch, C. (2019). 20Q: Speech sound disorders: “Old” and “new” tools. SpeechPathology.com. Hart, P., & Koch, C. (2018). Interprofessional Care of High-Risk Infants in C.R. Thompson (Ed.). Pediatric Therapy: An Interprofessional Framework for Practice. Thorofare, NJ: Slack, Inc.
Thatcher, K., Koch, C., & Johnson, M. (2018). Constructing professionalism: A developmental progression towards a standard of excellence. A poster presentation for the American Speech-Language-Hearing Association Annual Convention, Boston, MA. Koch, C., Thatcher, K., & Johnson, M. (2018). Professionalism: A Key Component in Academics, Service, and Scholarship. A poster presentation for the Samford University Teaching and Learning Mini-Conference. Koch, C. (2017). A View to the Future. A 1-hour podium presentation for the CEU Conference at Samford University. Invited presentation. Koch, C. (2017). The Contrast Approaches for Children with Speech Sound Disorders. A 1-hour podium presentation at the American Speech-Language Hearing Association Annual Convention, Los Angeles, CA. Koch, C. (2017). The Contrast Approaches for Children with Speech Sound Disorders. A 2-hour podium presentation at the Madison City Schools Professional Development Day. Invited presentation. Koch, C. (2017). Millennials, Meet Your Mentors. A 1-hour podium presentation at the Missouri Speech-Language-Hearing Associate Annual Convention. Invited presentation. Koch, C. (2017). Talking About My Generation? A 90-minute podium presentation at the Speech and Hearing Association of Alabama Annual Convention. Invited Presentation. Koch, C. (2017). Beyond the Basics: Interventions for Speech Sound Disorders. A 2-hour podium presentation at the Speech and Hearing Association of Alabama Annual Convention. Invited Presentation. Koch, C. & Thatcher, K. (2017). Integrating faith into pre-professional training programs. A 2-hour podium presentation at the Health and Human Flourishing: Multidisciplinary Perspectives Conference, Lithuania. Koch, C. (2017). Challenging behavior and communication in Autism. A 2-hour podium presentation at Mission India: A Training Workshop on Comprehensive Childhood Disability Management at Pushpagiri Medical College, Tiruvalla, Kerala, India.